Our company is the leader in this area including production and sales. With over 10 years experience of developing products. Please Click Here to fill out the form carefully. The quotation will be made according to the information in this form. Bulk orders for same face bobbleheads, For example, for your idol, film star, character, mascot. we can head to toe fully customized such bobbleheads from photos provided as requested. 4.Production lead time: 20-30 days for order quantity less than 50, 30 - 90 days for completed project and delivery. 6.All prices quoted FOB (not included the shipping fee),Freight is prepaid and added to invoice. 7. Payment: Sculpture and Mold $250.00 prepaid. Deposit by T/T. 50% of order total is due with sample approval. 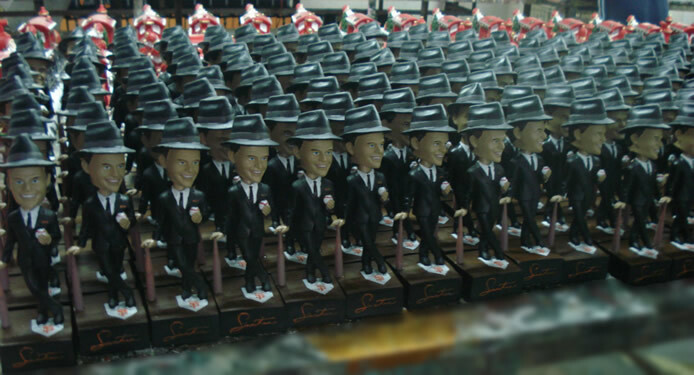 *No matter what kinds of bobbleheads you want, we will provide you the best price and top handicraft and service. Any question, please Contact Us for details.